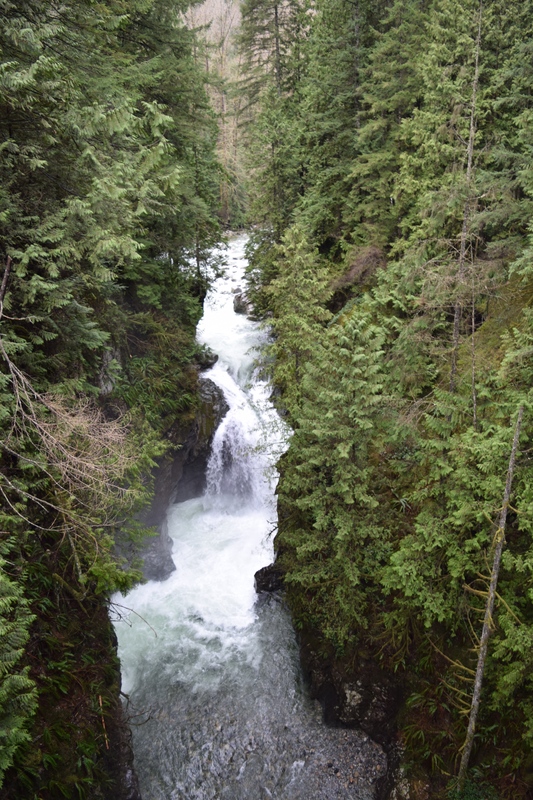 After such a successful first experience of observations at my chosen location (Lynn Canyon Suspension Bridge), I wanted to return to see if I would have the same success. I also took the time to walk the trails and fill my lungs with the fresh mountain air. I went on another weekend day, Saturday this time. The weather was overcast and damp, but it was not raining while I was there. Instead of sitting on a bench, with my notebook in hand I walked across the bridge, on the trails and around the river pools. After Dr. Dan’s class on research and analysis methods for “Front-end Analysis”, I decided to focus on defining the target of primary and secondary users. There was no shortage of people, locals and tourists. The mild winter that the Lower Mainland and the whole coast of North America have been experiencing has made tourist travel very easy and appealing. There is always a high amount of locals no matter the weather. I parked on one of the side streets and walked into the park around 3pm. Right away I observed there was a huge variety of people. Tourists and locals was the easiest distinction to make. There were visitors of all ages, new born babies (I overhead the father say the baby was 8 days old) to elderly people with mobility assistant devices. The babies were carried in strollers of various types, chest carriers, slings and car seats. It freaked me out when I saw one particularly tall parent carry their very young child with one arm across the bridge and lean over the railing in the middle. The elderly individuals used wheelchairs (power & non), crutches, canes and the supportive arm hold of a loved one. There were a lot of dog walkers, and the dogs came in all shapes and sizes. There was also a lot of runners, most were dressed for the elements and had on technical footwear and carried CamelBacks with fluids. The tourists were from all over; I heard German, Spanish, Chinese, Japanese, and Persian spoken. I also heard American, British, Russian and Australian accents. There were various types of photographers, some with simple and inexpensive point & shoot cameras to high end DSLRs with telephoto lenses. As I walked further along the trails, I came to the river pools and cliff jumping spots. There were four young men jumping, while tourists looked on giggling. There were people alone, large groups of people, couples and families. Everywhere I looked there were kids. Kids, kids, kids everywhere. Like the weekend before, there was also a large variety of individuals with different abilities. There was a young man in a motorized scooter, a middle-aged man with a “Hoover” cane (which denotes he has some sort of visual impairment) and a teenaged woman being supported by a friend or caregiver. There were people there to hike the trails and people simply to see or cross the bridge. I found it interesting how many different types of shoes people wore. There were high heels, runners, trail runners, hiking boots, Ugg boots, flip flops, fashion boots, boat shoes, loafers and rain boots. Some people carried backpacks, messenger bags, purses or nothing at all. Individuals had varying levels of layer of clothing on. Some runners were dressed very lightly which made sense because of their physical exertion. But some tourists had on shorts and t-shirts, which I thought wasn’t enough considering they were shaking. Some of the layers people wore were purely for fashion, while others were quite technical. Some people were heavily overdressed in down parkas with fur hoods. One man was even in a dress shirt and suit. Lots of the children carried toys or sports equipment, a few had small backpacks on. Again I noticed a mix of dog lovers to haters, with some people stopping to chat & take pictures with the large Bullmastif & his owner to others screaming in terror at the site of a Pomeranian. Some people carried glass water bottles, disposable coffee cups, Nelgene bottles, disposable plastic water bottles or reusable metal coffee cups. There were lots of tour groups, who followed a person at the front who carried a small sign. There were only a few people with gloves on, and a few children with mittens on. Some people wore cultural head dresses and coverings. If I had to define the primary and secondary users, I would say the Vancouver/ Lower Mainland locals are the primary users and tourists from other parts of Canada and the world are the secondary users. I would define the Lower Mainland locals as the primary users because they frequent the site regardless of the day of the week, the season or the weather. I found this exercise interesting because I was looking at all aspects of the people I passed in the park. I look at where they might be from, what they wore, what language they spoke, how they got around, and where they might live. Then I had to process that material into categories to determine who the main users of the park are. Something I scribbled in my notebook is that I would need to the site on all days of the week, to truly capture the target market. So currently without having talked to anyone, defining my target markets are all based upon assumptions.